While listening to “Mirage” from Lindsey Stirling’s new album, I realized that for years now, I’d missed the “N” in Trishna. I’d just assumed she was Irish. Trishna can be a given name and means “thirst or aspiration,” which fits. I’ve also had a scene of her parents meeting floating around for a while. Here’s a rough draft written from Trishna’s Mom’s perspective: I saw an adventurous man with long hair in the bus tunnel this afternoon. He was traveling in the opposite direction as me. We met eyes and reciprocated smiles. I started to speak and stammered. He stopped, held out a hand, and asked “shall we have coffee?” These details about the parents can help inform about her character. I’d just assumed the characters were Caucasian. Maybe it’s easier to write from one’s own perspective? During that song, I’d realized Trishna is Indian [Asian] and John is Indian [Native American], which I know is trivial but externalizing these ideas help reinforce my resolve since these discoveries mark a radical culture change. Writing outside my own perspective requires extensive research, or at least the respect to engage in other cultures openly, which sounds fun. Another “shouldn’t change much” thought. Since I wrote about the physical adversities that both Trishna and John would have to learn to embrace, well, nothing radical changed about them. They’re just characters. I used this phrase to describe the city, after being away from it as a daily commuter for a few months, and I might try to integrate the phrase into The Story. (It will at least be the title an upcoming Better Zombie feature series.) I really like this dichotomy. Within the city, or in anything in life really, there are elements that are less favorable and more favorable. Both the grime and the glitter help make a person, place, or thing more dynamic. Without conflict, internal or external, I get bored, even if the conflict is completing an ambitious project. 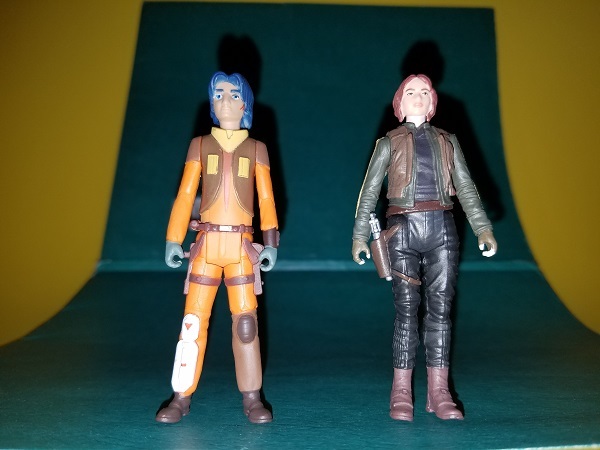 Searching for physical objects to represent The Characters led me to these two random toys of Ezra Bridger and Jyn Erso. While representing a close approximation, I’d like to customize both the sculpt and paint to look more like John and Trishna respectively, which is something I intend to do in addition to reviewing action figures on this website. In a sense, my professional work and my hobby work reviewing stories and objects, all eventually inform The Story.